Brothers John Oliver Couch and Stephen Gardner Couch were early Bronaugh residents. The 1850 census for Guilford County, North Carolina shows Thomas Couch and his wife, Eliza, with their large family including three-year-old Stephen and one-year-old John O. Couch. Marriage records for Guilford County show that Ithamar (Thomas) Couch had married Eliza Gardner on October 28, 1834. John Oliver Couch, 1849 - 1923. 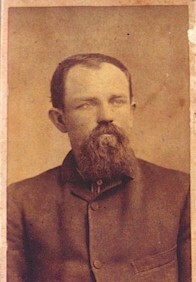 John first appears in Vernon County, Missouri records in 1880 when he was age 24, living with Charley and Alice Berry in Harrison Township. 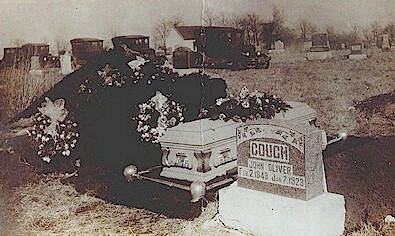 He was listed as Oliver Couch and he was said to be a servant. His wife was Martha Jane McCracken Yarbrough from Greensboro, NC (1858 - 1929). Based on the 1900 Harrison Township Census they must gotten married about 1888. Martha Jane had two daughters before she married John. They were Ida and and Mae. John and Martha then had a son, Clyde V. Couch. Birth dates listed in the 1900 census are May - January 1883, Ida - March 1884, and Clyde - July 1889. The obituary to the right from the February 2, 1929 Bronaugh Journal.is for Martha Jane McCracken Yarbrough Couch. 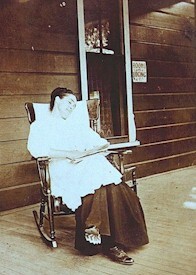 It confirms that she had two daughters with her first husband, Edward Yarbrough. One of them was Mrs. Ida Whitworth of Moundville. It also confirms that John Couch's death date was January 7, 1923. Photos from Staci Couch Anderson. 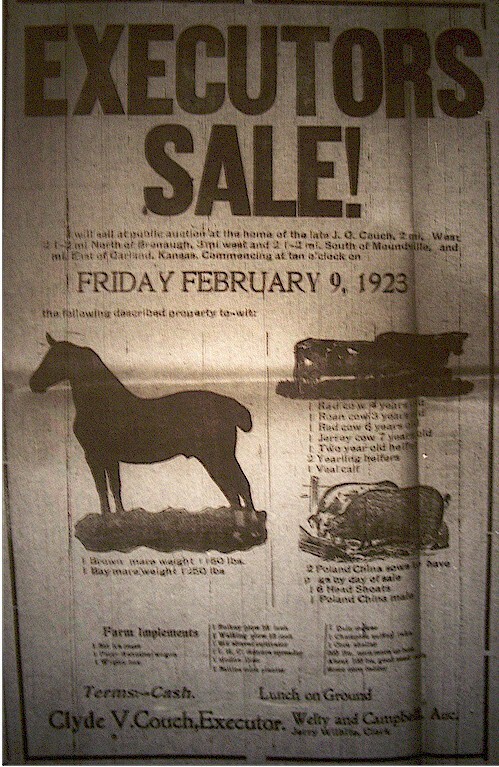 Below is the sale bill for the estate of John O. Couch. It is from the January 17, 1923 Bronaugh Journal. 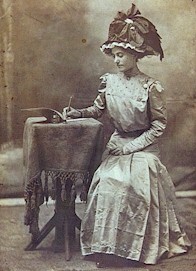 right and left photos: Nellore (Nellie) Packer wife of Clyde V. Couch. Worsley Cemetery shows Clyde, 1889 - 1958 and Nellore, 1888 - 1968. Her parents, Martin and Lucy Packer are buried in Worsley Cemetery. 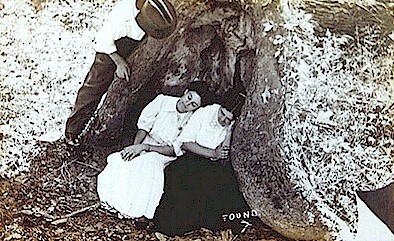 left: Blanche Packer, sister of Nellore. 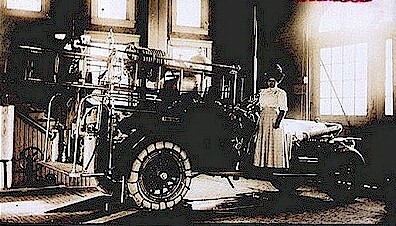 Blanche and Nellie were daughters of Martin and Lucy Packer. 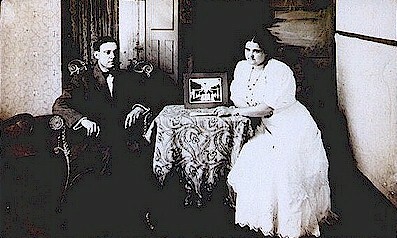 right: C. J. Francis and Blanche Packer were married in Vernon County between 1910 and 1920.The photo on the table appears to show either the front entrance to Marmaduke Park or the State Hospital in Nevada. The entrances were rather similar and not far apart. By the 1920 Vernon County Census, Blanche referred to herself as a widow. It should be noted that a third Couch brother also lived in Vernon County. William F. Couch resided in Coal Township, near Deerfield. He is buried at Deerfield Cemetery and his dates are March 23, 1935 - September 4, 1901. His wife, Lucy, is buried beside him. They had a daughter Edna, but the 1900 census says that they had had five children, but only Edna was surviving. Vernon County Marriage records show taht on February 16, 1903, Bertha Couch married Edward Harkreader, son of Thomas Knox Harkreader and Mary Etta Knox Harkreader. Harriet's death certificate tells that her parents were Abijah Kenworthy and wife Eliza.